Are we fighting a war on terror, or a war against predators? Surely the latter is more accurate. We see terrorists as predators. We fear them as such. They’re hiding in the weeds, morphing into the background, only to emerge to kill innocents with seemingly arbitrary (and thus very scary) rapacity. Therefore, following Barbara Ehrenreich’s amazing book, Blood Rites: Origins and History of the Passions of War (1997), “vulnerable” Americans believe they must band together to kill or cage these predators. It’s the way we control our instinctive fear of being prey — we’d much rather be the hunter than the hunted. When you see the enemy as murderous predators with no soul but that of a demon with a hunger to kill, why bother trying to understand them? Just go ahead and torture them. They’re soulless predators bent on killing your loved ones. Or go ahead and kill them, perhaps from the skies with drones: death by aerial sniper. Torture or death: it simply doesn’t matter when you’re dealing with mindless predators. But, and here’s the rub, who are the real predators? Are we not predators too? We sure pose as such. Look at our heavily armed drones and their names: Predator, Reaper. 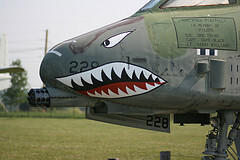 Look at our war birds and their names and nose art: eagles and falcons and raptors and warthogs with shark’s teeth painted around the 30mm Gatling gun of the A-10 Warthog. Are we not predatory as well? We reap what we sow. In the name of extinguishing predators, we become that which we wish to extinguish. In the name of saving lives, we kill. We fortify everything. We even spy on our closest allies because you just never know — they might be predators too. President Obama says his number one priority is keeping America safe, and we applaud. But his number one priority should be upholding our Constitution. It’s our communal laws and system of justice — our Constitutional safeguards — that ultimately keep us safe, not our predatory actions. Our quest to destroy the world’s predators is inuring us to our own predatory nature. The wild passions of war rule; endless cycles of violence are the result. Surely the war on terror is the ultimate oxymoron, since war itself produces terror. War feasts on terror. Indeed, war is the ultimate predator. The more we wage it in the name of eliminating the predators among us, the more we ensure its predations will continue. Such is the paradox of war.